'78 XS1100E along the Blue Ridge Parkway in 1997. Set up for sport touring. Superbike bars, small windshield, detachable bags. 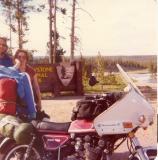 A heavily loaded GoldWing in the Mt Rushmore parking lot about 1995. On a Cincinnati to Seattle ride. My '74 R90/6 (I traded the Virago in on it). 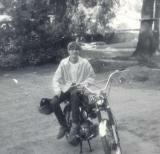 CB 160s were great little bikes.